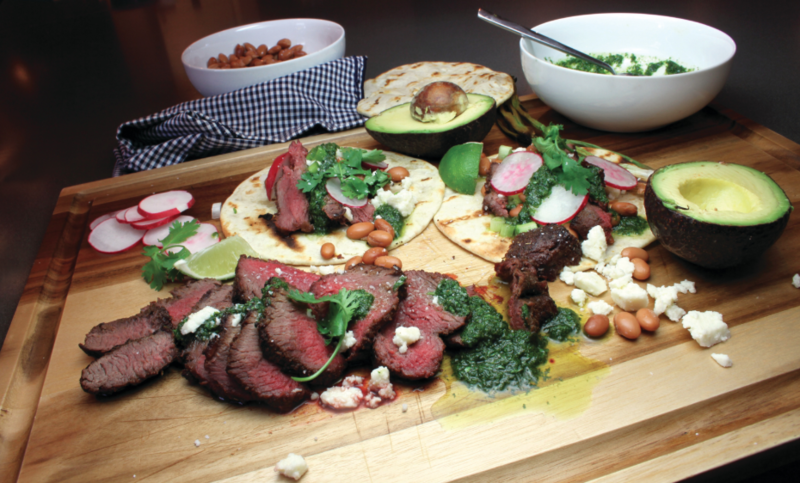 A fusion of cuisines combined with a medley of spices turn these grilled venison tacos with cilantro chimichurri into a mouthwatering addiction. Fusion cuisine or fusion food is a generalized term of dishes usually based on foods from one culture and prepared using different ingredients and flavors from another culture. In this recipe, I’m using what some refer to as the filet mignon, or the backstrap, along with a medley of seasonings common in Mexican dishes and an uncooked sauce that sources say originated in Central and South America known as chimichurri. Chimichurri uses several raw ingredients in no particular order that can be used either as a marinade or, more popularly, as a condiment for grilled meats. The more commonly known chimichurri is made with chopped parsley, minced garlic, olive oil, oregano, red pepper flakes and vinegar, but like most recipes there are always slight tweaks or variations. Since we’re making tacos, I like to replace the parsley with cilantro making the herb the dominant flavor along with a squeeze of lime giving the sauce a subtle tartness. I also like to use a food processor or blender to make the sauce slightly thick and smooth so it doesn’t drip out of the tacos when eaten. The fusion of the grilled venison meat seasoned with a blend of aromatic spices, combined with raw, colorful garnishing and topped with a slightly earthy but floral twang from the cilantro, chimichurri delivers a mouthwatering flavor combination any carnivore would devour. Using a sharp knife, remove any silver skin on the backstrap and cut into 3-inch thick pieces. Combine the cumin, coriander, garlic powder, oregano, chili powder and kosher salt in a bowl. Coat each piece of meat lightly with olive oil and then rub on the blend of spices. In a food processor or blender, add cilantro, garlic, cumin, coriander, salt and lime juice. Slowly pour in the olive oil and pulse to blend until smooth. Adjust with additional salt if needed. Heat an outdoor grill on high heat. Place the seasoned venison steaks on the grill for 3 to 4 minutes. Rotate and grill for another 3 to 4 minutes. Flip the steaks and cook until the internal temperature is about 120 degrees (medium-rare) or to your desired doneness. Remove from heat, loosely cover with foil and set aside to rest for 10 minutes. Thinly slice each steak on the bias or angle and serve on warmed tortillas with garnishes and a spoonful of the cilantro chimichurri sauce.